With the all-German UEFA Champions League Final on Saturday between Bayern Munich and Borussia Dortmund, I thought it would be a great time to share Coerver Coaching’s experience in German football. 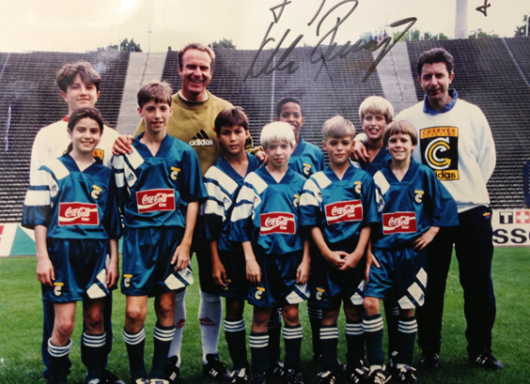 In 1988, Charlie Cooke and I were approached by adidas in the USA to do a Coerver Coaching clinic in Cincinnati, featuring German World Cup legend, Karl-Heinz Rummenigge. Karl-Heinz told us he had no real knowledge of the Coerver Coaching Method, and I agreed to meet him at his hotel the day before to go over some Coerver Moves, which was the theme of the session. In the 80’s our curriculum was mainly focused on Ball Mastery and 1 v 1 Moves. Karl-Heinz told me it was a great concept, and he had never been introduced to such a coaching program when he was a young player. I explained that the Coerver Coaching Moves were modelled on great players such as Beckenbauer, Cryuff, and Stanley Matthews. We discussed creating a Karl-Heinz Rummenigge Move for the clinic the next day. A few hours later, practicing in his room at the hotel, we came up with what we now call in Coerver Coaching “The Side Step” Set. This comprised of the single and double Side Step. Karl-Heinz was a superb athlete, and above all a great pro. 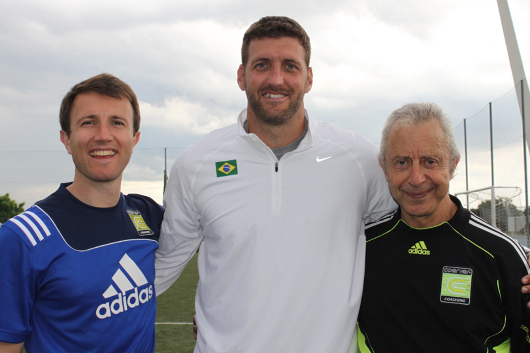 The next day, we did the clinic with Karl-Heinz and Coerver kids from our Cincinnati school. Hundreds attended and by all accounts it was a great success. That evening Karl-Heinz and I went to dinner, and he told me that in Germany there was little emphasis on teaching technique in such detail, and he really wanted to introduce Coerver Coaching into Germany, as he felt technique was one topic that German players needed to improve on. We kept in touch, and in 1990, he contacted me about a TV project he was planning. The series was called Tele Soccer, a TV Football show hosted by him. The concept was to feature 10 of the greatest players of the day, giving tips to young players. He wanted me to write the coaching content, based on the Coerver Curriculum and to provide 12 young players to come to Germany for the filming. We selected 12 young players from the USA and the UK and we went to film the series at the Olympic Stadium in Munich. Karl-Heinz would introduce the Star. The Stars featured included Jürgen Klinsmann, Franz Beckenbauer, Marco van Basten, Pierre Littbarski, Rudd Gullit and Karl-Heinz himself, demonstrating a Skill Topic and then our Coerver kids doing a drill to improve that topic. The 12 part TV series was a great success and aired all over Europe. It was also a wonderful recognition of Coerver Coaching. Following the success of this series Karl-Heinz, who was also the Vice President of Bayern Munich at the time, asked me to come to Bayern to instruct his youth coaches on the Coerver Coaching Method. This began a 17 year relationship between Bayern Munich and Coerver Coaching. Over these years I visited the club several times and did many clinics for the coaching staff. Initially I worked with Björn Andersson, who was the Technical Head of the Bayern Munich Academy. 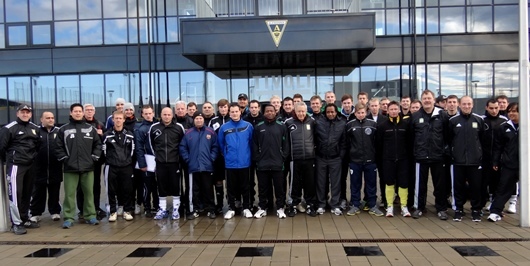 I also knew the Academy Director Werner Kern well, and he was also a big supporter of the Coerver Program. 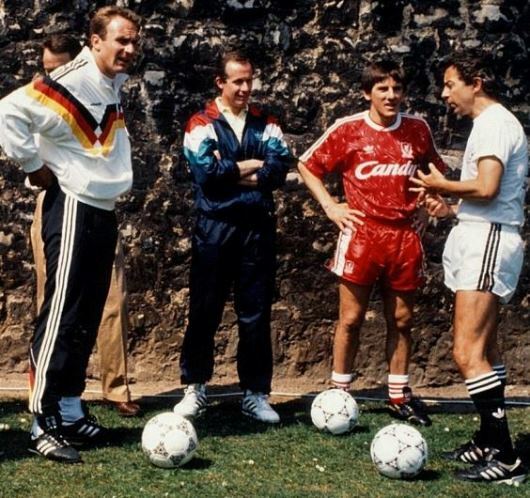 The great Gerd Müller was one of the coaches, and Stephan Beckenbauer was also one of the most enthusiastic coaches when it came to learning about Coerver. Björn Andersson also asked me to work on Ball mastery and Moves with individual young players, one being Owen Hargreaves, a young Canadian player who went on to be a Bayern, Manchester United and England Star. 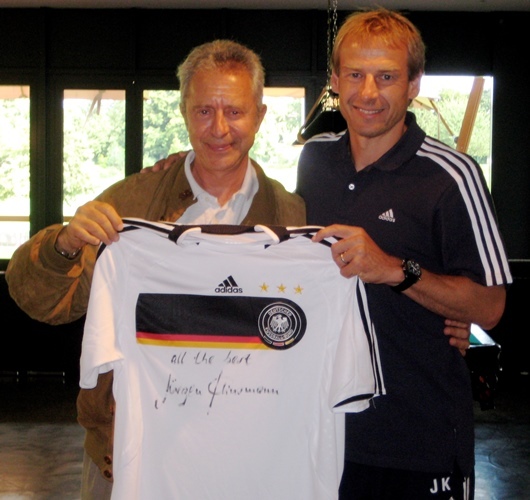 At the 2006 World Cup in Germany, through adidas, and the support of Jürgen Klinsmann and FD21, Coerver Coaching did many clinics around Germany and featured at the World Cup Village in Berlin. 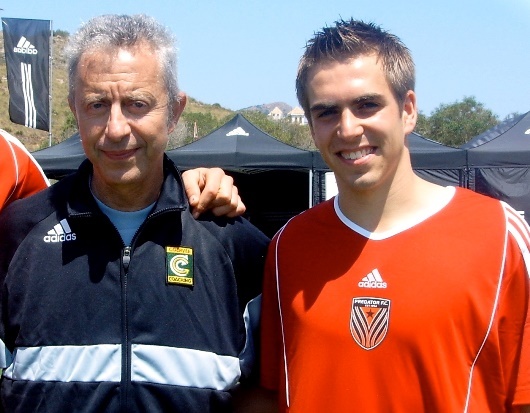 In 2008 Klinsmann became Head Coach of Bayern and I again started working with the Bayern Coaches on a more intensive education program featuring Coerver Coaching. In the 2000 Euro Championships, Germany did very poorly and they identified technical levels as one cause. They determined that the solution was investment and thought into Youth Development. The talent education program started in the season 2002/03 with 366 DFB-bases across Germany. 1000 certified coaches are working there (fee-bais paid), coordinated by 29 fulltime regional directors. The second step was that every Pro club had to build an academy, at the moment there are 49 plus a few academies from regional federations in regions without a Pro club. The third step was that every academy had to work with one of the 29 elite schools of sport. The class schedule is balanced so that players have much more time to play football than in regular schools. An additional benefit is that DFB-coaches and youth coaches from Pro-Clubs go into the schools to do extra training in the morning (in the afternoon they go to training at their academies). Since the National focus was heavily on improving technical topics, the Coerver Program became crucial to many coaches, through exposure to the Coerver Clinics or through the DVDs/Videos that had been on the German market since the 90’s. The credibility of many years working with Bayern also advanced the Coerver influence on German football. Coerver Coaching has expanded all over Germany since I started working there in the 90’s. We have conducted many camps for young players nationally and coaches clinics at Bayern Munich; FC Nuremberg; FC Kaiserslautern; Arminia Bielefeld; FC Schalke 04, Alemannia Aachen and FC Cologne. We have written three articles for the DFB coaching magazine including one that was filmed, which is part of the DFB online coach education library. Several of the Coerver Coaching Videos/DVDs are best sellers in Germany and have been so since the 90’s. The first Coerver Coaching Camp was in 2006 and in 2008 Rafael Wieczorek became the Director for Coerver Coaching in Germany. He has now 7 head coaches and 35 junior coaches operating across the country. In the last five years Coerver Coaching in Germany has delivered approximately 50 courses with more than 1500 coaches and we have worked with more than 100 different grassroot clubs. In 2012 we had over 2000 players in Camps and football schools and 495 coaches in different clinics. We also do regular events with our official partner, adidas®. We have done 25 events nationally with adidas®, including introducing their latest products such as F50, Predator, micoach and the new nitrocharge. Coerver® Coaching kicked off their 2013 European Youth Diploma courses in Spain with a two-day course hosted by Spanish footballing giants, Real Madrid CF at their world class Ciudad Deportiva del Real Madrid training centre in Valdebebas (see below image). Over 70 coaches attended from all across Spain including Sevilla, Coruña, Barcelona, Madrid, Albacete and Jaén. Ten coaches from the Real Madrid CF Academy and the Head of the Madrid Coaches Association attended in addition to former Spanish Pro player, Diego Camacho, who was attending his second Coerver® Coaching Youth Diploma course. Alfred Galustian, Coerver® Coaching Co-Founder delivered the course and said “I have worked at some of the top football clubs all over the world and have never seen a better training facility than here at Real Madrid. It was fantastic to come back to work here and to see so many coaches come from clubs all over Spain including a large group of academy staff from Real Madrid”. A highlight of the event was the attendance of Eduardo Oliveira, from the Brazilian Football Association (CBF) Technical Department. Eduardo who also works for Botafogo FC had travelled from Rio de Janeiro specifically to evaluate the course (see below image with Alf & Jimmy Galustian). Eduardo said “We have of course heard of Coerver Coaching in Brazil, but I did not expect it to be such a high level as I saw on the Coerver Diploma Course that I attended at Real Madrid. I believe that Coerver Coaching is especially effective during the golden ages of skill acquisition (7-16). Alf Galustian the co-founder of Coerver, has a lifetime of experience and is obviously an international expert in technical teaching; we can certainly learn from him and the Coerver program in Brazil”. Coerver® Coaching were on hand to assist their global partner at the adidas® lab which took place over 5-days during the build up and following the UEFA Champions League Final at Wembley. The purpose of the adidas® lab was to showcase four new, ground-breaking innovations that will launched in future seasons by the world’s leading football brand. Special guests, retailers, bloggers and competition winners from across the world descended on Victoria House in London to visit the adidas® lab where they had the oppurtunity to test the new innovations which included the miCoach Elite Team System, the adidas® Smart Ball (see below image, Coerver® CEO Jimmy Galustian), in addition to the worlds lightest ever playing kit (630g) and football boot (99g). Coerver® Coaching CEO, Jimmy Galustian and UK Director, Scott Wright provided coaching expertise during the event within the Smart Ball Zone. The adidas® Smart Ball, which has been in development for the last three years, has been designed to improve technique, power, spin and accuracy through an automated coaching system. Coerver® Coaching have been part of the project team, providing expertise on ball mastery and ball striking techniques. German great, Michael Ballack and French legend, Zinedine Zidane, who were assisted by Jimmy & Scott, demonstrated their amazing shooting techniques in the Smart Ball zone (see below image of Michael Ballack in the adidas ®Smart Ball Zone). 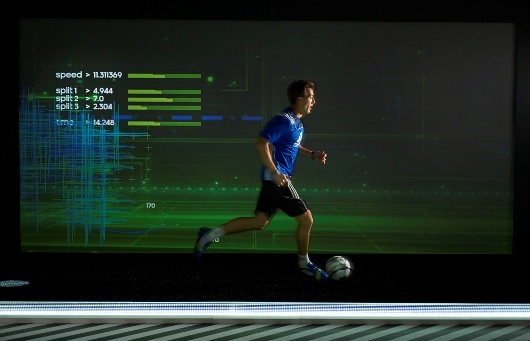 Coerver® CEO, Jimmy Galustian (see below image – adidas® lab speed test) said “It was great to be invloved in such a high profile event before, during and after the UEFA Champions League Final at Wembley with our global partner adidas. This event highlighted that without doubt, adidas are the leading football brand in the world and are at the cutting edge of football technology. We are really pleased to be assisting with the development of some of this new technology showcased here at the adidas lab that will help to shape the game in the future”. Coerver® UK Director, Scott Wright added “It was great to be working with different people from so many countries who had been invited by adidas to attend the event. Also having the oppurtunity to assist Zinedine Zidane and Michael Ballack was a fantastic experience, I even had the chance to play in goal againt Zidane, that was definitely a once in a lifetime experience that I’m not going to forget for a long time!”.